Dr. Saint is no more, Lord Dove has disappeared, and the Dodo has slipped back into seclusion. 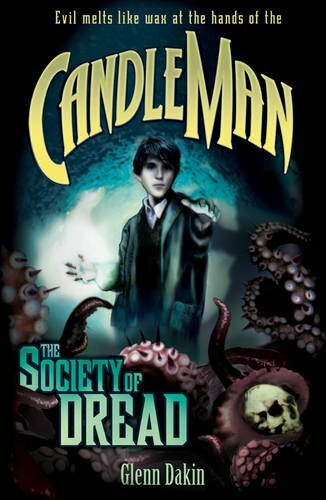 But for Theo Wickland, descendant of the Victorian crime fighter of legend, The Candle Man, the adventure is just beginning. Now head of the Society of Good Works, Theo is determined to turn the activities of the order toward the betterment of humanity, starting with bringing the Network, the fascinating, secret underground maze of tunnels, back to its former glory. But dark forces still lurk below the London streets - mysterious creatures, and enemies of the Candle Man, long thought dead - who continue to plot the downfall of the world. Old enemies become new allies as Theo cobbles together a group to stop the sinister plans of these evil beings before they prove deadly. It is up to the new Candle Man and his Society of Dread to snuff out these nefarious plans, before it's too late. Why I read this: I absolutely loved the first book in this series and had to continue on with the next. Plot: With this second book in the series, there are new friends introduced along with new enemies. Theo must now descend below ground to save his friends who have been taken and enslaved by a wicked man whose power lies in destruction. there were some great twists to this book that put the world and history of Candle Man into perspective in a way that I wasn't expecting. I absolutely love the setting of these books as the dark setting amplifies the darker plot. The end of the book eluded to another adventure and I cannot wait to read on. Characters: Theo is a character that I would compare a bit to Harry Potter, he's got the complexion, the past and the sort of clumsy way of stepping up to doing his part and saving those he loves. I love his comment about feeling better when he has direction, which shows a lack of confidence in his character. I love flawed characters and Theo definitely has a lot to learn about his powers, how and when to use them, and coming to terms that he will kill when he uses it. I really like how he is developing and can't wait to see what the next book will bring next for him. Relatability: I think fans of underdog heroes, antiheroes, and steampunk will enjoy this series. Cover Commentary: I have to say I love these covers, both US and UK versions of them. (The UK one is pictured above). 1. One lucky winner will receive both of the Candle Man books. 2. Fill out the form to enter. 4. Contest ends Friday, July 15th. Comment on this review and Glenn Dakin's guest post for extra points. Awesome review! This book looks like a load of fun, and one I would surely pass along to my son. I will have to put this one out there for my middle schoolers! Thanks! I had no clue there was a second one out yet. Cool! Theo sounds like an interesting character and I do like underdog heroes. I;m definitely a fan of this series as well! I haven't read the second book though! I didn't even know it was out! See what I know.. These seem like great books, will have to check them out! Thanks for the chance. I hadn't heard of this book or the first one before now. Sounds good. This sounds like a good reader for younger audiences but detailed enough that adults could enjoy as well. Ty for your thoughts! I just recently found Steampunk and I'd love to read this one to see how it is addressed in the YA genre. How totally awesome - both books. My wishlist is out of control and I always like to start with book one - thank you for this generous giveaway opportunity. Ooh steampunk MG read, sounds great! Can't wait to get into this series! Thanks for the review and giveaway! I read the first one and enjoyed it as well. I need to get more kids reading this series. I think they'd like it. As for the covers - I like this one a lot!